After the second rest day, it was clear that playtime was over. We were going to see some swingin’… that’s exactly what happened. Caruana continued the debate and trotted out the Rossolimo with 3.Bb5, but after Carlsen’s 3…g6 4.O-O O-O 5.Re1 e5, he trotted out the speculative 6.b4!? This line has quite a bit of venom and has caught than a few unsuspecting victims. Carlsen played 6…Nxb4 (6…cxb4 7.a3) after which Caruana played 7.Bb2 instead of the more confrontational 7.c3 Nc6 8.d4. The text move of 7.Bb2 still gives black a chance to make mistakes. GM Daniel King noted Fischer-Spassky 1992 had the same gambit theme after 1.e4 c5 2.Nf3 Nc6 3.Bb5 g6 4.Bxc6 bxc6 5.O-O Bg7 6.Re1 e5 7.b4!? cxb4 a3 and white won brilliantly. The American continued with the gambit narrative with 8.a3! and ended up with a slight edge. The point of playing these gambits is not necessarily because they are strong, but because it is easy for black to go very wrong. The world champion tread carefully and correctly with 11…Ne7! 12.Qe2 b4! Caruana started to slow down from his brisk pace and on move 19 went into a 31-minute tank after 13.Qc4 Qa5+. He considered 14.d4 which he joked “probably loses”. The game picked up again with the black king taking a circuitous walk all the way from e8-d7-c7-b6-b5-b4-c3-d3-e4-f5. 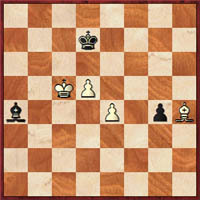 Despite this chase white had no chances to ensnare the black king and a truce was called after 34 moves. Truly an exciting game. 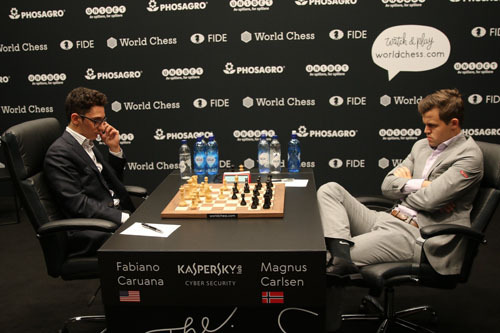 Caruana playing an obscure gambit certainly got Carlsen’s attention. This was something that did not appear in the secret video that caused “screen gate” last round. Unfortunately, GM Ian Rogers reporting on this matter got into a disagreement with U.S. 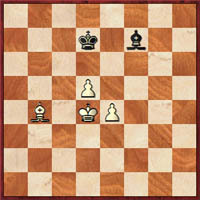 Chess Online on publishing the video with the screenshot. Sadly parting ways with @ChessLifeOnline after a decade. 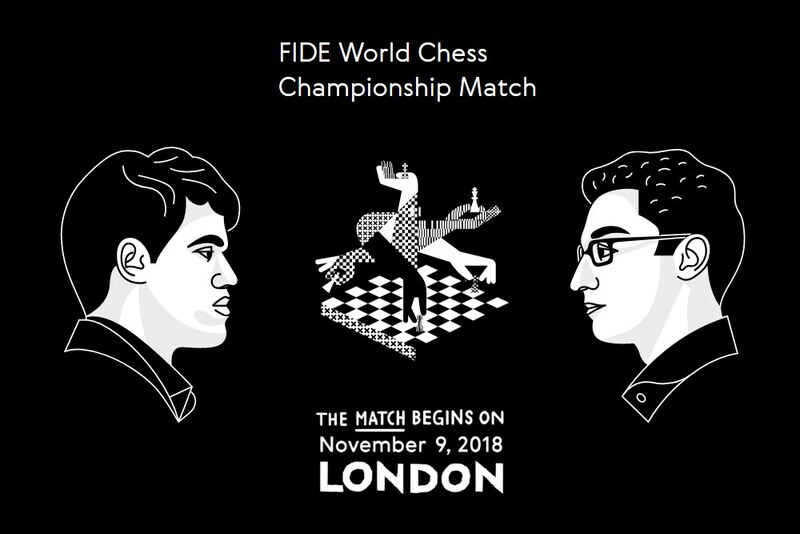 I declined to accept edits to my round 4 World Ch'p report which would downplay responsibility of editors of the Caruana video, downplay the effect of the video on Caruana's chances, and omit the key image from the video. Sad case. Rogers stated via Twitter that he will still maintain his relation with the parent magazine, U.S. Chess Life. 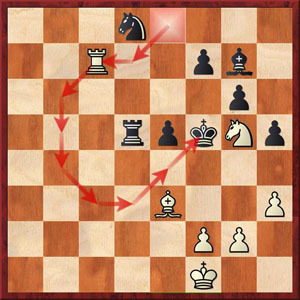 I have played this Rossolimo gambit six times in classical play and have +5 score against comparable competition. Below is my analysis of the Caruana-Carlsen game and then a game of my own. 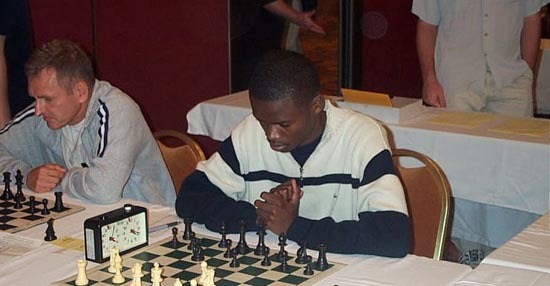 In the 2007 World Open, I played a few games where my appreciation of endgames was useful. One of the games was an opposite-colored bishop ending. On the left is a position I found in the Batsford Chess Endings book; on the right was a position I had in a game against Zahkar Maymin. On the left, black has set up a fortress and the game is drawn (Averbakh study), but on the right, I was able to make the black king give way. It appears as if my opponent can get to the drawing position, but he cannot swing his bishop from a4 around to f7 in time… while keeping his king on d7. Notice the difference in the two positions. I didn’t remember the exact book position during the game, but I had an idea. Note… sacrificing the g-pawn makes little difference. In this scenario (two files over), the bishop colors are switched and it makes a big difference! 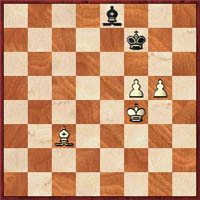 On the left, the game is drawn (Hennegerger study), but on the right in Simutowe-Ippolito, white was able to outflank the king and simultaneously prevent the bishop from blockading. The first position, the bishop provides the king with ample room. In the second, Ippolito’s pieces do not have enough space to set up a defensive front. 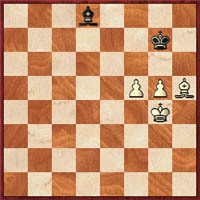 The key is white’s control of the a1-h8 diagonal. Perserverance is a must in endgames.